This football match came as a fun surprise during my one-day stay in El Salvador. The past few weeks I’d been reading Paul Theroux’s The Old Patagonian Express where he describes his journey from Boston to Patagonia by train in the early 80s. I was just reading the part he went through El Salvador, where he met people on the train who invited him to watch the game El Salvador - Mexico in Estadio Cuscatlán, the biggest stadiums in Central America. He brilliantly describes the madness around the stadium and during the match and I marvelled at this random occasion, one that just happens to you when you travel. To me happened sort of the same. I was only going to stay the night in La Zona Hostel in El Salvador, until I was invited by Daniel and Andrea, the hostel hosts to join them supporting their club Alianza against Santa Tecla, the two biggest rivals of El Salvador. Both are die hard fans and try to go to every match. Kjet, A hostel guest from Norway and big football fan, joined us too. When we arrived at the stadium there was a roaring mass of white an blue, mainly Alianza supporters. People selling beers, preparing food on barbecues. There was a big brass band with lots of drums, it looked like everyone who plays something brought their instrument. The music, loud and upbeat, never really stopped, even during the game. Different tickets are being sold. The majority are the 'Suns' and the ‘Shades’. The first group is by far the largest crowd, covering the entire east part of the stadium on concrete benches, the sun right in the facing during the entire game. These are the cheapest tickets, for the poor and the working class, about 70% of the crowd. The Shades are on the other side, which had numbered chairs in the shade, and above that the balconies and private boxes for the most expensive tickets. I was happy to be among the Suns and not on the other side, which looked a bit boring from our side of the stadium. There was such an energetic vibe going on. All the singing and dancing, it didn’t stop. I could hardly follow the game, as much as was going on around me. When Alianza scored a goal, which I missed, the singing got just a bit louder, because the volume was already through the roof. We were among the hooligans of Ultra Blanca, the original fan club of Alianza wearing white. There were internal conflicts some years ago which resulted in a rivalling club, Barra Brava 96, who wear black. Both clubs support Alianza, but in the past it has happened that they end up in fights with each other, when the energy runs high. In the middle of the Suns tribune there is rope to divide the two clubs. Currently there is a much more friendly vibe among the clubs, but I was advised to stay on this side of the rope. At the end of the game we met the president of Ultra Blanca and were welcomed as special guests. It was the first football match I had gone to. Kjet had been to many, in Norway and Europe. But he had never seen something like this, especially not in his hometown Kristiansand. The Norwegian football supporters are much more focussed on closely following the game, without getting too emotionally involved. 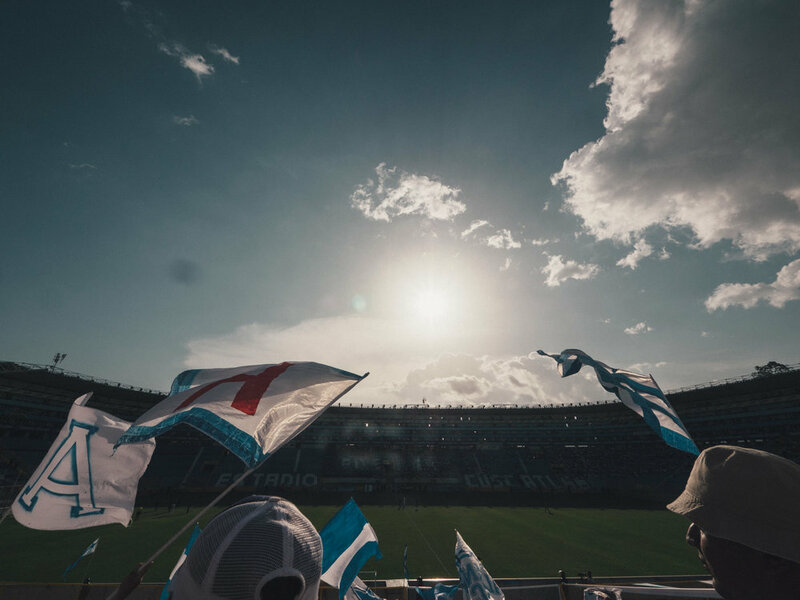 A stark contrast to the The match finished equally in 1-1, Santa Tecla scored in the last minute, leaving the Alianza fans deeply disappointed. Outside of the stadium they would usually wait until the players come out to congratulate them and cheer them on. But as much love the players received during the game, they were being ignored after these mediocre results. Everyone was a bit sad when we drove home, Kjet included. Club love is infectious if you're a football fan. According to the San Salvadorians this was a boring game… I had the time of my life.